Cells present an external face covered with glycoproteins. This includes receptors for cytokines and cell adhesion as well as nutrient transporters. Cells adapts to nutrient availability and external conditions by selective changes to the glycoprotein at the cell surface. As part of this process, glycoproteins are co-translational modified in the lumen of the rough endoplasmic reticulum by N-glycosylation at NXS/T(X≠P) sites. Glycoproteins then transit to the Golgi where the N-glycans are trimmed by glycosidase, and remodelled by the branching N-acetylglucosaminyltransferases (Mgat1,2,3,4,5). Pathway activity is regulated by the availability of the donor substrate, UDP-GlcNAc, which is generated from salvage of GlcNAc and de novo from glucose, glutamine and acetyl-CoA. The GlcNAc branches are extended to form binding sites for galectins, C-type lectins, and siglecs. The galectins crosslink glycoproteins at the cell surface forming a dynamic lattice with liquid droplet-like properties (PMID 17418791, PMID 23378517). Glycoprotein affinities for galectins depend on NXS/T site number (sequence encoded), expression of the N-glycan branching enzymes (tissue specific) and UDP-GlcNAc levels (metabolism). The lattice regulates retention and activity of receptors and transporters at the cell surface. Examples include EGF and TGF-ƒÒ receptors, glucagon receptor, T cell receptor, CTLA-4 co-receptor, and transporters of glucose and glutamine. Our computational model has been validated in cell culture, mice and humans autoimmune disease. The lattice model of adaption at the cell surface plays a role in cancer progression (PMID 22957033, PMID 17400585, PMID 15459394, PMID 11217864), stem cell renewal and aging (PMID 17483135), metabolic homeostasis (PMID 21106670, PMID 25395405, PMID 24550542, PMID 20064370), behaviour (PMID 17883406) as well as autoimmune diseases notably multiple sclerosis (PMID 21629267, PMID 11217864, PMID 12417426, PMID 15585841, PMID 17488719, PMID 17418791). Our current studies are focused on the relationship between central metabolism and UDP-GlcNAc-dependent adaptation at the cell surface in cancer and autoimmune disease. 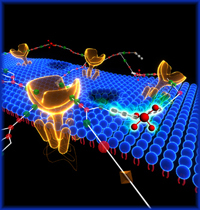 Approaches include genetics, biochemistry, cell biology and computational modeling, with the aim of new therapies and diagnostics. Dr. Wendy L. Johnston in our lab has shown that C. elegans requires UDP-GlcNAc very early in development for the synthesis of the eggshell GlcNAc polymer, chitin. Chitin forms a protective barrier that blocks entry by supernumerary sperm during fertilization. It is also required for movement of the sperm pronucleus to the cortex; the initiating event that reorganizes the cytoskeleton and PAR proteins during anterior-posterior polarization. Additionally, chitin is crucial for high fidelity meiosis, polar body extrusion, and turnover of oocyte proteins during the cellular switch to a zygotic phenotype. Synthesis of chitin depends on the hexosamine pathway enzyme glucosamine-6-phosphate N-acetyltransferase 2 (GNA-2), which is developmentally regulated and rate limiting for UDP-GlcNAc biosynthesis (PMID 17042944, PMID 20971008, PMID 22083685). Gna-2 null mutants are maternal effect embryonic lethal and a screen for suppressors yielded mutants of sup-46. SUP-46 is an RNA-binding protein that localizes to stress granules (image above). Many external and internal stresses induce RNA-binding proteins and translationally-stalled mRNA to form stress granules, which capture large subsets of mRNA and hundreds of proteins. The granules form as a result of RNA-protein and protein-protein cross-linking that induces a phase transition into a gel-like or liquid-droplet state. Phase transitions are widely observed; however, the biochemical impact of these alternative molecular environments is poorly understood. The hexosamine pathway biosynthesis has been implicated in phase transitions. SUP-46-regulated a set of transcripts that overlap extensively with those regulated by a number of small RNA-binding Argonaute proteins required for gametogenesis and early development during stress. We are studying SUP-46 interactions with small RNA pathways in the regulation of gametogenesis, early development, resistance to stress, and hexosamine pathway biosynthesis. We are also investigating possible roles for human homologues of SUP-46 in proteostasis, a central feature of neurodegeneration in Parkinson's, Amyotrophic Lateral Sclerosis (ALS) acute multiple sclerosis and Alzheimer's diseases. 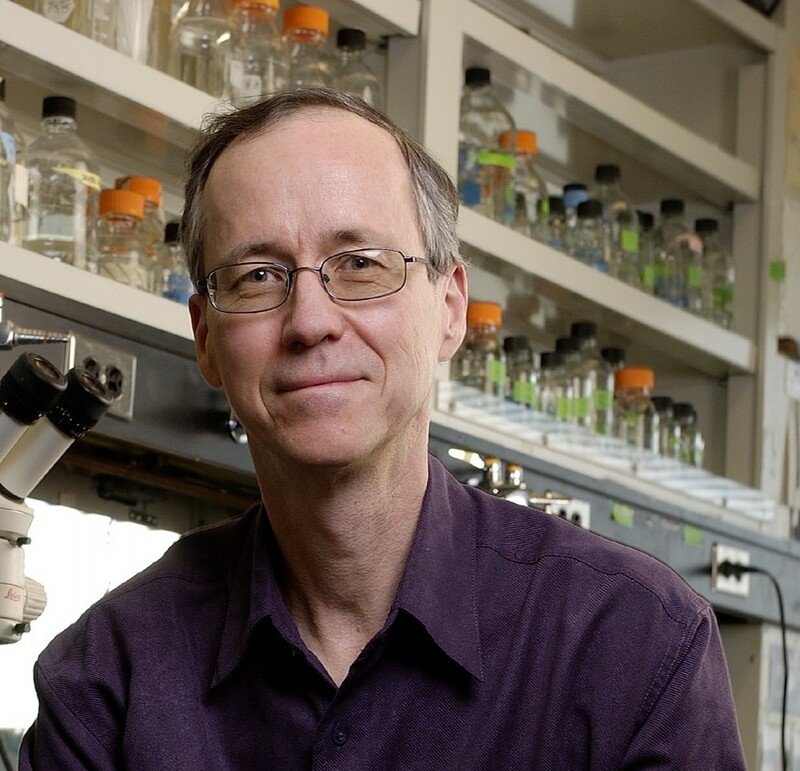 Dr. Charles Warren initiated the C. elegans work in our lab as a postdoctoral fellow more than 15 years ago. He was the first to show that a worm glycosyltransferase, GLY-2, could rescue a homologous deficiency in mammalian cells (PMID 11937505, PMID 11744632). Charles was assistant Professor at University of New Hampshire (PMID 19729382) before his death in a paragliding accident in August, 2005. Charles is sorely missed by many friends. Dr. Swallow’s team is investigating the cellular and molecular mechanisms of cancer recurrence, with the goal of developing more effective treatments to prevent cancer spread. Polo-like kinase 4 (Plk4). Polo-like kinase 4 (Plk4) is serine/threonine kinase found at high levels in aggressive cancers of the colorectum, pancreas and breast, and its elevation predicts resistance to conventional cancer therapies (PMID 11301255, PMID 8756623, PMID 8022793, PMID 11597015, PMID 15640847, PMID 20348415, PMID 16025114, PMID 25174401, PMID 20348415). Our lab has identified a novel function for Plk4, regulating cancer cell migration and invasion in cultured cells (PMID 25174401). We are now employing mouse models to examine the effect of Plk4 on cancer invasion and metastasis in vivo, as well as using systems biology and high-throughput proteomics approaches to define the pathways and networks through which Plk4 regulates cancer cell behaviour. Our ultimate goal is to expand the treatment options for patients with advanced cancers. A first generation Plk4 inhibitor has recently entered phase I trials in breast cancer patients. The results of our studies will guide the development and application of other more refined Plk4 inhibitors, and other similar targeted agents, in cancer patients. Metastasis Genes in Colorectal Cancer. This project takes a relatively unbiased approach to discovering new "metastasis genes". Using our database of patients who have undergone removal of a primary colorectal cancer at Mount Sinai Hospital, we have identified individuals who subsequently had liver or lung metastases removed, and for whom both primary and metastatic tumour tissue has been banked. Taking advantage of this unique resource, we are comparing gene expression in the primary and metastatic tumours in the same patient. The hope is to uncover not only markers but drivers of the metastatic phenotype, with the intention of better understanding the underlying mechanisms of aggressive behaviour and developing innovative targeted therapies. Role of Surgical Technique in Cancer Recurrence. Seeding of cancer cells into the surgical wound can lead to painful recurrence that is difficult to manage effectively. We have just launched a major investigation into the role of surgical gloves and instruments in wound seeding. We will use mixed research methods to perform a systematic review of the literature, a survey of practising surgeons who perform cancer surgery, and in vitro proof of principle studies of cancer cell transferability, and will document the degree of contamination of gloves and instruments during cancer operations. Once we better understand the magnitude and potential implications of this contamination, we will design a mouse model to mimic operative conditions and determine how to minimize this source of cancer cell seeding and recurrence.